Mauritius is far more than just white sand beaches and crystal clear waters. Mountain trails, dense forests and lush vegetation provide the ideal trekking territory for keen ramblers. 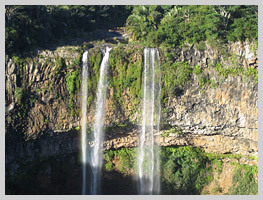 The Black River Gorges National Park offers a unique opportunity to get close-up experience of the island's natural vegetation: stunning during the flowering season (from September to January), the National Park offers a privileged view of rare trees and flowers and many types of animals throughout the year. Crossing the section from Le Pétrin to Grande Rivière Noire, the river that gives the park its name, allows visitors to admire several of the most fascinating landscapes of the Mauritian interior. There's a 2 kilometre trek to reach the beautiful seven waterfalls, which are the highest on the island, one with a single plunge of almost 300 metres. 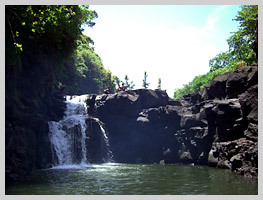 Visitors can relax in a natural deep water swimming pool located at the bottom of the seven falls, surrounded by ideal walking and trekking country. Here nature has gone wild, creating an artist's palette from the soil and bringing the area its name of the Seven Coloured Earth. Formed due to uneven cooling of the Earth's crust, the seven different coloured strata located about four kilometres from Chamarel attract many visitors every year. 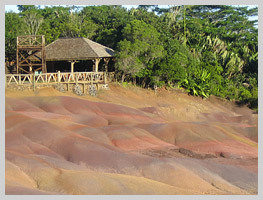 One of the unique features of the coloured earth is that even if the different colours are mixed together in a test tube, after a few days they will separate again into the original colour strata. True nature lovers shouldn't miss a visit to Domaine du Chasseur, a splendid nature reserve that can be visited on foot or in a 4WD vehicle, offering opportunities to admire the unique local fauna and flora or enjoy the exquisite local cuisine at the La Crécerelle or Le Panoramour restaurants. Nearby is the fascinating Domaine de l'ylang ylang, the last remaining perfume distillery on the island, which, apart from producing essential oils based on extracts from flowers, camphor and pink pepper, offers tours around the plantations, the distillery, and the garden of fragrances.